As a practicing physician and longtime member of his hospital’s ethics committee, Dr. Barron Lerner thought he had heard it all. But in the mid-1990s, his father, an infectious diseases physician, told him a stunning story: he had physically placed his body over an end-stage patient who had stopped breathing, preventing his colleagues from performing cardiopulmonary resuscitation, even though CPR was the ethically and legally accepted thing to do. Over the next few years, the senior Dr. Lerner tried to speed the deaths of his seriously ill mother and mother-in-law to spare them further suffering. These stories angered and alarmed the younger Dr. Lerner—an internist, historian of medicine, and bioethicist—who had rejected physician-based paternalism in favor of informed consent and patient autonomy. The Good Doctor is a fascinating and moving account of how Dr. Lerner came to terms with two very different images of his father: a revered clinician, teacher, and researcher who always put his patients first, but also a physician willing to “play God,” opposing the very revolution in patients’ rights that his son was studying and teaching to his own medical students. But the elder Dr. Lerner’s journals, which he had kept for decades, showed the son how the father’s outdated paternalism had grown out of a fierce devotion to patient-centered medicine, which was rapidly disappearing. And they raised questions: Are paternalistic doctors just relics, or should their expertise be used to overrule patients and families that make ill-advised choices? Does the growing use of personalized medicine—in which specific interventions may be best for specific patients—change the calculus between autonomy and paternalism? And how can we best use technologies that were invented to save lives but now too often prolong death? In an era of high-technology medicine, spiraling costs, and health-care reform, these questions could not be more relevant. As his father slowly died of Parkinson’s disease, Barron Lerner faced these questions both personally and professionally. He found himself being pulled into his dad’s medical care, even though he had criticized his father for making medical decisions for his relatives. Did playing God—at least in some situations—actually make sense? Did doctors sometimes “know best”? A timely and compelling story of one family’s engagement with medicine over the last half century, The Good Doctor is an important book for those who treat illness—and those who struggle to overcome it. Fortunately, however, my father saved his notes, which not only illuminate his early medical career but also provide a moving depiction of him at the height of his powers, as he was practicing an intense type of medicine that might best be described as all-consuming. My dad provided a crucial service to internists, surgeons, and other physicians by diagnosing the illnesses of their sick patients and then prescribing effective antibiotics. His overarching concern for the physician-patient relationship also shone through in many of the cases that he documented. As an infectious diseases consultant, my father turned out to have a front-row seat to some of the emerging ethical issues--such as medical errors and the limits of medical technology--that would soon burst forth into the public spotlight. But his approach to these issues remained largely based on paternalism and beneficence: How could and should the doctor help his patient navigate these complicated and often controversial questions? Given his background and training, which stressed “Doctor knows best,” he could hardly have chosen a different approach. Meanwhile, I was a fairly typical teenager, trying to balance schoolwork, friends, and jobs. Two important decisions I made during these years were to have a bar mitzvah and to work for two summers at a nursing home at which my father was the medical director. The first represented an important exploration of my Judaism, although, like my father, I had great ambivalence about religion. The second turned out to be a dry run for my becoming a doctor. Not all cases of infection require an infectious diseases consultation. Garden-variety pneumonias and urinary tract infections, for example, can be treated with a standard assortment of antibiotics. The task becomes even easier if a culture of the infectious material--such as sputum, urine, or blood--grows a specific organism. The microbiology laboratory can then test specific drugs against the bacteria in question, simplifying the choice of medication. So when my dad was called in on a case, it was a good bet that it was complicated, either because the source of infection could not be determined or because the choice of antibiotic was unclear. For the most part, my father was happy with this arrangement. Like most physicians, he loved difficult and unusual cases, as they made for interesting discussions in the hospital corridors, on rounds, and at the citywide infectious diseases conferences he inaugurated in Cleveland in the late 1960s. Plus, even though my dad was incredibly busy, being a consultant provided him with considerably more flexibility and independence than his colleagues had, with their regular office hours and hundreds, perhaps thousands, of patients. A typical case that my father saw in the early 1970s was a man with a lymphoma and an unusual pneumonia whose doctors were deciding whether or not to do a lung biopsy, which would involve opening the man’s chest. Deducing that the man had pneumocystis pneumonia, which occurred in immunosuppressed patients and would later become a common malady of the AIDS era, he convinced the team to skip the biopsy and treat the patient empirically with antibiotics. The man recovered completely. So did a teenager with congenital heart disease who had endocarditis. Despite being treated with penicillin, he was still running temperatures as high as 105. The patient’s cardiologist was worried because the infection was not getting better, and he consulted a surgeon about replacing the infected heart valve--a major operation that the boy might not have survived. Noting that, despite his high temperature, the patient appeared to be improving, my father implored the physicians to hold off on surgery. He added another antimicrobial agent to treat what he thought was a small pneumonia. The patient never required surgery and was cured of both infections. A man with pancreatic cancer had recurrent bacterial blood infections. He had recently become infected with a highly resistant strain of an organism called Serratia. The team was at a loss as to what to do to save the man’s life. My father reached into his bag of tricks and suggested trying an older antibiotic, tetracycline, not normally used for this type of blood infection. The patient recovered, although he ultimately died from the cancer. When an eighty-five-year-old man was admitted to the hospital with a severe infection of his neck, my father was able to diagnose a condition that was very rare: Ludwig’s phlegmon. The infection, which had first been described by German physician Wilhelm Frederick von Ludwig in 1836, had become uncommon in the antimicrobial era but was still featured in infectious diseases textbooks. The infection required drainage of the abscess in the operating room, and my dad scrubbed in for the procedure. The surgeon had so little experience with such cases that he took my father’s recommendation that he do an extra-long “guillotine incision” of the neck to help treat the patient. My dad’s consult notes, which reflected his intimate knowledge of the diseases in question, were often tutorials for the doctors (and patients) involved. When an elderly man with advanced lung disease continued to have fevers and positive sputum cultures, my father wrote: “In patients with chronic restrictive pulmonary disease, who have trouble raising secretions, antibiotic therapy of an acute pulmonary infection leads to bacterial overgrowth of the respiratory secretions.” The treatment: stop antibiotics and pound on the man’s back four times daily to mobilize his phlegm. It worked. As in this case, my father’s successes often resulted from using fewer as opposed to more antibiotics, an approach he had learned early on from Louis Weinstein and one that he would impart to generations of Case Western Reserve medical students, house officers and fellows. One woman with multiple myeloma, who had been admitted repeatedly for infections, had a pneumonia that would not respond to any treatment. Given her overall condition, my dad, thinking it was cruel “to put her through any more torture,” recommended that antibiotics be withdrawn and the patient made comfortable. The pneumonia, or whatever the lung condition was, resolved. In another case, a woman had severe diarrhea probably related to previous use of an antimicrobial. A visiting professor had seen the patient and recommended “massive antibiotic therapy” to clear out what he thought was an infection in the intestines. But my father had noticed that in addition to the diarrhea, there was mucus in the stool, indicating that the patient’s immune system was already fighting the diarrhea. He recommended stopping all antibiotics and simply giving her sugar water, “the way one would treat an infantile diarrhea.” The patient recovered over the next several days. Finally, my father consulted on a man who had been admitted with three weeks of high temperatures from an unclear source, a condition termed fever of unexplained origin (FUO) in a well-known 1961 paper by Paul Beeson and his Yale colleague Robert Petersdorf. With antibiotics, the patient’s fevers had come down but had not gone away. My dad convinced his colleagues to avoid any further invasive testing and send the patient home. They agreed, and the temperatures gradually disappeared. So how did my father instinctively know when to be aggressive and when to cut back? He would have cited his clinical expertise, beginning with his years as a medical resident and an infectious diseases fellow in Boston and continuing with his experience as an attending physician in Cleveland. Indeed, after the case described above, he planned to compile a series of his FUO cases, those patients “who spontaneously recover without any definitive diagnosis and without ever again getting into trouble.” This, after all, was the sort of clinical research that my father did during his years in Cleveland--retrospective studies of cases that shared a common characteristic, usually infections caused by a particular rare organism. The research was top-notch and published in excellent, peerreviewed journals. In order to improve his knowledge and conduct his research, my dad diligently tracked down patients who had been discharged, often sending them personal letters. But my father’s style of research belonged to an earlier era. By the late 1970s, the randomized clinical trial--in which large numbers of patients were enrolled in formal studies and followed prospectively over time--had come into ascendancy. Researchers sought major grants from the National Institutes of Health (NIH) and often collaborated at multiple medical centers throughout the country. Only through this type of sophisticated scientific analysis, biostatisticians argued, could true knowledge be obtained. Case studies like those done by my father were interesting but not necessarily representative. Still, on any given day at any given hospital, consultants like my dad and Weinstein could amaze colleagues, students, and patients. In one instance, the VA doctors asked my father to see an unusual case of pneumonia that had stumped everyone. But he knew this bacterium well. “It was Nocardia,” Robert Bonomo, who trained under my dad, told me a few years ago. “He came over and nailed it.” On another occasion, when several physicians were evaluating acomplicated skin infection, my dad was the only doctor present who knew all the planes of tissue where bacteria could hide. J. Walton Tomford, another Cleveland infectious diseases specialist, fondly recalled attending the citywide conference at which my father and the two other local infectious diseases gurus, Marty McHenry and Manny Wolinsky, had the opportunity to show off their vast knowledge about the field--even taking one another on at times. “It was like our church and synagogue,” Tomford told me. These doctors also loved to visit their colleagues’ hospitals. In one memorable case, my father asked McHenry to come to the Mount Sinai to convince a very reluctant Orthodox Jewish woman that she needed to have a lung biopsy. When McHenry, a devout Catholic, took out his rosary to pray for the woman, she quickly acquiesced. In another instance, when no source of infection could be found in an older woman with a high fever, my father suggested that an artery along the side of her head--which was not at all tender--be biopsied to look for inflammation. The medical literature suggested that the condition he was looking for, temporal arteritis, caused only low-grade temperatures in the elderly, but my dad had seen three other cases with high fever. To the surprise of everyone, even my father, the biopsy was positive and the diagnosis was made. “This really represents the evolution of a consultant’s experience,” he subsequently wrote. Once, an internist asked him to see a young woman who had developed a rash on her right forearm several days after receiving the antimicrobial ampicillin for a fever and sore throat. My father saw her at her home because she lived near us. I presume he took with him his black doctor’s bag, which he used for his infrequent house calls and which contained the slides, syringes, and other equipment he needed to make a diagnosis. The rash was very distinctive, extending in a linear pattern from her elbow to her wrist. It was petechial--that is, composed of small purple spots caused by broken blood vessels. My dad immediately suspected meningococcemia, the severe bacterial blood infection on which his future mentor Weinstein had been lecturing on the day they met in 1960. Employing a bit of showmanship, my father asked the woman if she had recently been playing tennis. Startled, she said that she had, a few days before, around the time she had first seen her internist. He later attributed this feat of clinical acumen to the concept of locus minoris resistentiae (place of least resistance), taught to him by Weinstein. Due to the vigorous motion in the patient’s forearm caused by playing tennis, the meningococcal bacteria had preferentially settled there and caused a rash. Before leaving, my dad put a drop of liquid from one of the lesions onto a slide, returned to the hospital, and did his own Gram stain, confirming the diagnosis. In yet another case, my father overruled an “excellent internist and competent ophthalmologist” and prescribed a low dose of an antileukemia drug for a woman who had shingles that involved her eye. The patient’s symptoms dramatically improved by the next morning. The basis of his decision? Observations that he and an infectious diseases colleague at nearby University Hospital had made that, in fact, contradicted a controlled study of the medication that had recently been done at the NIH. “Another aspect of the case that is certainly worth commenting on is the beautiful demonstration of the value of a specialist in a given situation,” my dad later wrote. “This is really a minutia type of therapeutic maneuver and can only come about through word of mouth and personal experience.” Although he closely reviewed the results of major clinical trials, he passionately asserted that keen clinical observation remained the most important way to approach illness and care for sick people. To what degree was my father truly bucking the trend in medicine that increasingly favored population-based data over clinical intuition? In her 2013 book on Sister Kenny, the famous polio nurse of the 1930s and 1940s, the historian Naomi Rogers argues that Kenny actually constructed an alternative pathophysiological model of the disease based on her personal bedside observations. That is, she rejected the then-current scientific explanations for how polio crippled patients, feeling that the mechanism responsible was the muscle spasms she observed, as opposed to nerve damage. Kenny’s novel treatment strategy for polio, which involved mobilizing paralyzed muscles as early as possible, followed directly from her unorthodox perspective. Seeing, in other words, was believing. I encountered this epistemological conundrum when researching breast cancer: certain patients insisted that their cancers were caused by toxic exposures and others assured me that screening mammograms had saved their lives even though controlled-study data indicated that both scenarios were unlikely. Firmly grounded in scientific medicine, my father did not hold radical beliefs. But he practiced what the sociologist Charles L. Bosk called, in his 1979 book on surgical training, “clinical individualism.” My dad believed that his observations and research constituted a type of clinical reality that was lost when physicians considered only the characteristics of a given disease among large populations of patients. More provocatively, he thought that doctors could use their clinical acumen, experience, and even empathy to reach conclusions about how specific illnesses acted or were likely to act in specific patients. Without scientific proof, of course, these claims could always be contested. But for my father and those trained in a similar manner, such insights needed to be considered at patients’ bedsides. Regardless of their beliefs about how medical knowledge was best generated, my dad’s colleagues largely appreciated his insights and were glad to have a meticulous, experienced, and compassionate physician looking over their shoulders. But he was not universally beloved. My father had extremely high standards and little tolerance for those who he believed were lazy or incompetent. If a patient needed antibiotics emergently and was not getting them, according to Robert Bonomo, my dad would yell, “You need to do this now!” until it happened. In one instance, my father learned that a senior surgeon was planning to follow his usual routine and give a penicillin compound to a patient who was already on the operating table. Believing that the patient had a penicillin allergy, my father went to the operating room and demanded that the patient be given a different antibiotic. The situation was tense but Phil Lerner ultimately prevailed. In his early years as a consultant, my father weighed carefully “the pros and cons of stepping on toes.” Later in his career, he often directly confronted certain colleagues, which probably contributed to an informal nickname that he acquired over the years: the Madman of the Mount Sinai. My father justified such conduct by an intense devotion to his patients, which emanated from his upbringing and training and was, for him, the heart of medical practice. He went the extra mile not only to comfort his patients but also to demonstrate behaviors that he hoped other doctors might emulate. Of course, my dad’s ability to sit down with patients, spend time with them, and answer their questions was enhanced by his job as a consultant in the postwar, pre¬±managed-care era. Paul Beeson had advocated the same humanistic approach. So did fictional television doctor Marcus Welby, who was on the air from 1969 to 1976. A representative case was that of a twenty-eight-year-old woman admitted for severe intestinal bleeding and several related complications whom my father described as “emotionally-shocked,” “terribly sick,” and “frightened.” Even though she turned out not to have an infection, my dad was the one who calmed her down during a “fantastic screaming spell” that he suspected was due to the “frightening stillness” of the regular ward once she had left the “hustle and bustle” of intensive care. Appreciating his kindness, the woman relied on him both during and after her hospital stay. “A very rewarding experience,” he later wrote, “but really outside my primary area of interest.” So, too, perhaps, was the time that he spent a half hour speaking with a woman with a severe bone infection who had become upset when one of her other physicians had made a lighthearted remark about her condition. Another patient my father bonded intensely with was a young man who showed “considerable fortitude and maturity” while battling ultimately incurable endocarditis. Although my dad strove to maintain a strictly “professional relationship” with his patients, he admitted that he had developed a “genuine affection” for this man. One of my father’s more interesting encounters involved a patient who wrote to him to protest what he believed was an excessive fee for a ten-minute consultation. My dad wrote him back and explained that the consult had also involved discussions with the man’s doctors and nurses as well as a review of his chart and X-rays. The patient was evidently impressed because he paid the entire bill and added in an extra five dollars for the time it had taken my father to write a reply. This gesture was perhaps the 1970s equivalent of paying the doctor with a chicken. The five dollars was, of course, returned. This encounter was quintessential Phil Lerner: he went the extra mile to explain and demonstrate his philosophy of doctoring, and he gained a patient and a friend in the process. My father’s concern for his patients was only enhanced by the fact that so many of them had a personal connection to him. Having lived most of his life in Cleveland and its suburbs, he knew many Jewish families. Of course, he also had personal connections to many non-Jewish patients, who were often former classmates, friends, and colleagues. In the words of the historian David J. Rothman, “doctor and patient occupied the same social space,” promoting a shared relationship. Meanwhile, the poor and minority patients my dad met for the first time at the Mount Sinai--including many he would then follow for years--got the same royal treatment. Just as my father’s choice of profession was in part out of gratitude that he’d grown up an ocean away from the Holocaust, his devotion to these ward or service patients, as they were called, was his way of acknowledging his good luck in the face of so many ongoing catastrophes around the globe. His goal was to “take extra pains with the service patients, to be certain they are reassured and confident in your care, and come to believe that you really care about him or her as an individual.” One way he did this was to take advantage of his flexible schedule. “It’s so simple,” he wrote, “to make an extra visit in the afternoon for these special cases, come back to report a new lab test result, review an X-ray [or] reassure that the scheduled test is necessary, important and will lead to some conclusive information.” Illness, he underscored, was “frightening.” When I read these words many years later as a professor, I had to smile. It was the exact sort of advice that I gave to students and residents when teaching them about the history of medicine and the doctor-patient relationship. My dad had acted this way as a matter of course. Another group of my father’s patients consisted of doctors, nurses, other hospital employees, and their relatives. There may be no higher compliment for a physician than to be asked to care for a colleague’s loved ones, and my dad was definitely a “doctor’s doctor.” The 1970s was still an era of professional courtesy, and my father generally waived or reduced his fees when treating coworkers or their family members. This concept of the medical profession as a sort of guild that looked out for its members was a comforting one and may even have contributed to my decision to become a doctor. I remember seeing a few of my dad’s peers for sundry medical issues and feeling as if I was in good hands. Whether he was caring for a friend, a relative, or a stranger, my father’s clinical interactions were always dominated by a paternalistic philosophy. It made sense to him that, since physicians trained for decades, spent long hours in the hospital, and devoted themselves to the care of both the poor and the wealthy, they should call the shots, and patients should acquiesce. Doctor knew best, whether he--and it was usually a he in those days--was renowned Harvard surgeon Francis Moore, polio vaccine inventor Jonas Salk, or heart transplant pioneer Christiaan Barnard. Practicing any other way was an abrogation of one’s duty. Physicians of my father’s era saw their paternalism as not only altruistic, but therapeutic: it was widely believed that if patients followed doctors’ orders (and that is what therapies and other interventions were called), they were more likely to recover. Sometimes in serious illness, New York infectious diseases specialist Walsh McDermott said, the physician himself was the treatment. Thanks to the large number of clinical advances in the postwar years--many of which came from experimental research--the medical profession at this time was gaining enormous prestige. The new antimicrobial agents had made formerly ubiquitous and scary diseases, like syphilis, tuberculosis, and bacterial pneumonia, far more manageable. The discovery and synthesis of insulin meant diabetes was very treatable. Salk’s vaccine had led to dramatically lower rates of polio, the dreaded summer plague. Meanwhile, the ability to bank blood made possible more aggressive operations for aneurysms, cancer, and other conditions. By the early 1960s, there were medications to treat high blood pressure, and dialysis machines to prolong the lives of patients with severe kidney disease. It was no longer enough to simply be a kindly and caring physician; the public also wanted doctors who were engaged with the latest laboratory research. “If They Can Operate, You’re Lucky” was the tagline for a cover story in the May 3, 1963, edition of Time magazine that detailed several innovative and aggressive new operations. From a modern vantage point, it may seem curious that patients were so passive when dealing with such a serious topic as lifethreatening illness. And there have always been patients who have questioned their doctors and disregarded their advice. But many sick people welcomed the opportunity to have highly trained professionals make all their decisions. One explanatory model for this behavior, introduced by Harvard University sociologist Talcott Parsons in 1951, was called the sick role. Relieved of their normal duties due to their illnesses, patients believed they had an obligation to do what was necessary to get well, specifically by cooperating in the therapeutic process. Thus, while Columbia professor Robert Loeb’s domineering personality bothered some patients, most revered him. But by the early 1970s, the situation had begun to change. Over the previous decade, a series of research scandals revealed that some physicians had been willing to put fame and science above their concerns for patients. These violations occurred despite the fact that the Nuremberg Code--written in 1946 in response to the inhumane experiments carried out by Nazi physicians during the Holocaust--had explicitly mandated that all subjects must give informed consent before being enrolled in research. Yet in one case, a doctor studying the body’s immune response to cancer had actually injected cancer cells into the skin of chronically ill noncancer patients at a hospital in Brooklyn. These individuals, many of whom were, ironically, Holocaustsurvivors, were told only that they needed an injection. Andwhat about the deliberate administration of active hepatitis virus into physically and mentally disabled children at the Willowbrook State School on Staten Island? The researchers argued that since there were frequent outbreaks of hepatitis at the institution, these children would get the disease anyway, and the study might lead to a preventive vaccine. But wasn’t this doing harm to a population that could not consent? The outrage reached a peak in 1972 when an Associated Press reporter revealed that in Tuskegee, Alabama, the US Public Health Service had observed poor southern African American men with syphilis for as long as forty years in order to study the “natural history” of the disease. The researchers had even continued the experiment--depriving the men of treatment--when a highly curative antibiotic, penicillin, became available in the 1940s. Many of the subjects died of syphilis as a result of this deception. That the men in the Tuskegee study were black and the doctors who conducted research at major medical centers were overwhelmingly white was especially objectionable in an era of civil rights protests. Meanwhile, some women with breast cancer were in almost fullfledged revolt. For decades, surgeons had done biopsies of breast lumps while women were under anesthesia. If the biopsies were positive, the surgeons believed immediate radical mastectomies were indicated. Rather than awakening their patients to obtain consent, they preferred to forge ahead with the procedure, although if a woman was married, the surgeon would ask the husband’s permission.When a woman awoke from this operation, she commonly reached for her chest to see whether or not her breast was still there, an experience that many described as thoroughly traumatic. In the early 1970s, with the support of an iconoclastic surgeon from the Cleveland Clinic, George Crile Jr., a group of activist women began to refuse both this combination procedure and the reflexive use of such a mutilating radical operation for small, localized breast cancers. The best known of these women was Rose Kushner, a Washington, DC, journalist whose story I was privileged to tell in The Breast Cancer Wars, my book on the history of breast cancer. Confronted by this feminist initiative, most breast surgeons initially became more--not less--paternalistic, and at times patronizing. For example, in 1971, another journalist, Babette Rosmond, got her surgeon to agree to do just the biopsy of a breast lump. But when it came back positive and she asked for a few weeks to consider her options rather than immediately undergoing a radical mastectomy, he called her “a silly and stubborn woman” and made the ridiculous claim that she might be dead in a few weeks without the procedure. "Should Doctors Take Care of Their Relatives? ": an essay from Barron Learner on Slate. Read an interview with Dr. Lerner in The Atlantic. The first two pages of the book tell a dramatic story of a doctor using his own body to prevent other doctors from resuscitating a dying patient. What would you have thought if you were a doctor in that room? If you were a family member? If you were the patient? Each doctor practiced medicine in very different time periods. What changes in medicine do you think caused the biggest differences between father and son? What do you think is the strongest similarity between the two? In his third and fourth year as a medical student, the second Dr. Lerner witnessed several physician-patient interactions that raise ethical and philosophical questions about the practice of medicine. Which specific encounters made him most uncomfortable? How did these instances pique his interest in the ethics of patient care? 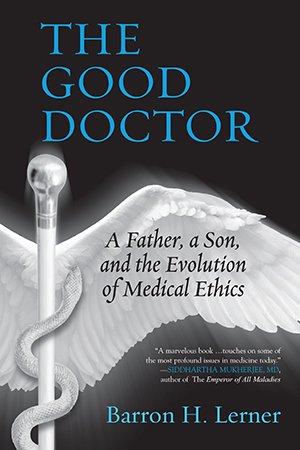 While the first Dr. Lerner was inspired to choose a career as a physician from a “sense of survivor’s guilt and appreciation for his good luck,” the second Dr. Lerner says that his choice to become a doctor was primarily “as a way to do good for others.” What do you think this says about the generation gap between the author and his father? What do you think is the primary motivation for doctors today? The author says that his father’s “devotion to the scientific basis of medicine left him with little interest in religion or the supernatural.” How did Meyer’s death and his wife’s illness challenge this thinking? In which viewpoint do you think he found the most closure? The debate of the ethics of patient autonomy vs. physician authority creates a huge divide between the older and younger generations of physicians. How would you like to see these two philosophies balanced in your own medical care? Have you had any positive or negative experiences of either philosophy? The first Dr. Lerner has some memorable patients: Laura, Susan, and Jonathan. How did reading stories about them in his father’s journals affect the author as a physician? What about as a historian and bioethicist? Writing in his journal was an important and primary outlet for the first Dr. Lerner to release his frustrations, thoughts, and memorable experiences. What does the second Dr. Lerner learn about his father through his journals that he wouldn’t know otherwise? What fears did the elder Dr. Lerner have for the future generations of doctors? Do you think his criticisms of the younger generations of physicians were reasonable? Why or why not? One criticism of new medical trends is that doctors and medical care have become too reliant on technology. What are some examples of this from the book? Do you think that doctors’ reliance on technology is good or bad for their patients? Why? When his father is admitted to Menorah Park, “a top-notch local nursing home,” the author is distressed to see his father among “the other severely ill residents” and compares this to the time when he “was the supremely confident and able medical director, rushing around the building, caring for and reassuring such patients.” Have you had similar experiences caring for older relatives? At his younger age, the second Dr. Lerner criticizes his father’s role as the primary physician for many family members because it blurs proper boundaries between doctors and patients. Later on in the book, he finds himself doing the exact same thing. How does this support or undermine his clear-cut notions about physician-patient relationships? Imagine the author did not come across his father’s journals. How would this have changed his understanding of his father’s career, relationships, and personal life? Do you think there were any negative consequences of reading his father’s journals? In the prologue, the author asks, “Did physicians of my father’s era actually know their patients in a different – and better – way than physicians do today?” By the end of the book, do you think he was able to answer this question for himself? How would you respond to this question after reading The Good Doctor?